I needed a nice cake to bake for my Da's 75th birthday and I know he loves carrot cake, so I've adapted this recipe to suit. Da's not a vegan but he is a healthy eater. 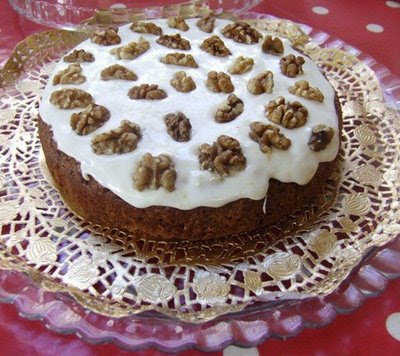 This is an insanely simple cake (though it’s a bit of work) and it’s low in sugar and fat per slice; it hits a few food groups too, what with the carrots, walnuts and flour. It’s positively healthy, I think! This cake is 'low-sized' - a euphemism for squat-looking - so if you really wanted to scrape and grate six carrots, you could make two, and sandwich them with vegan cream or butter cream. We tasted the cake on Saturday. Yum!! You know, you wouldn't need a second layer of it - it's dense and rich and filling with just the one layer. And the lemon icing turned out really well - bittersweet and zingy. Perfecto. I love it when a new cake comes together! Decided to try it last night. It turned out perfect, delicious and light and moist. The wholemeal flour really makes a difference. The only hard part I found was grating the carrots, I’ve muscles on me muscles today, otherwise it was simple, easy to follow instructions ;-) and quick to make. Unfortunately I made the icing a little too early and it set before the cake was ready to be iced, so I made a second lot of icing this time using cream cheese, (not for the vegan’s I know) but it turned out really well. I’m off now this evening to try and prefect your Banana bread! I'm interested that your cake was light - mine was quite dense, almost heavy. Very filling. I'm trying a new carrot cake for Mr Vegan's birthday. If it goes well, I'll send you the recipe! I am now CRAVING carrot cake.